Situated within 24 acres of marvellous woodland, this luxury camping site combines the tranquillity of the countryside with the excitement of the beach and ocean. 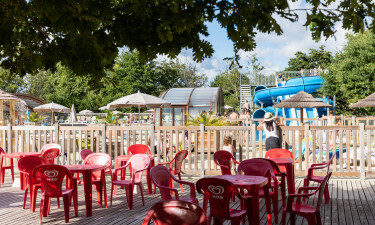 Why is Camping Le Soleil des Landes so special? The sparkling new water park with its spacious sun terrace and choice of pools is where most will want to head to first. Adults can swim in the large heated pool, whilst the kids whoop it up on the water slides. For toddlers there is an outdoor splash pool and indoor pool with water games. Practice your swing on one of the 2 tennis courts, or challenge friends to a game of football, volleyball, basketball or boules. Bicycles are also available for hire. The wonderful Cap de l’Homy beach is 7km away and there is a free shuttle service available in high season. The beach is also a paradise for windsurfing, kayaking and sailing. Boats and boards can be hired in Lit-et-Mixe and classes are available too for the inexperienced. For more peaceful recreation, hire a paddle boat for the whole family and head up the beautiful Courant de Contis creek. The magnificent Landes forest is the largest planted forest in Europe and is famous for its fauna and flora. It can be explored on foot, bicycle or, best of all, by horseback. For high-octane thrills, the leisure park Adrénaline Parc Moliets offers paint balling, quad biking and airborne trails. 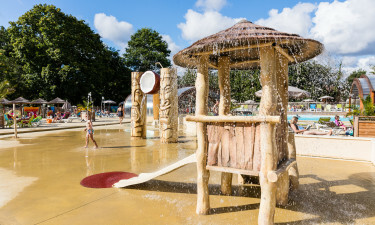 Alternatively, test your nerves on the aquatic rides at the Atlantic Seignosse aqua park. Dare you ride the Super Kamikaze? The French are famous for their food and wine and not to sample some of the many dishes and wines would be a shame. Fortunately, there are many fine restaurants serving succulent delicacies and superb wines in the picturesque village of Lit-et-Mixe. The elegant market town of Dax is famous for its spa and has a great variety of restaurants, cafés and bars to dazzle the taste buds. Further inland, the town of Mont-de-Marsan and its 14th Century castle are not to be missed. There is a restaurant with a terrace and takeaway service, plus a bar. A market with daily deliveries of bread caters to all your luxury camping needs. Lit-et-Mixe has a supermarket and other small shops for whatever else you may need.